A lovely friend from work had been thrifting one day and thought of me when she saw this dress, so she bought it for me. It parades its 80's origins in the shoulder pads and shape. I like the D-ring detail at the bottom and the wide band adds an interesting shape to the dress. 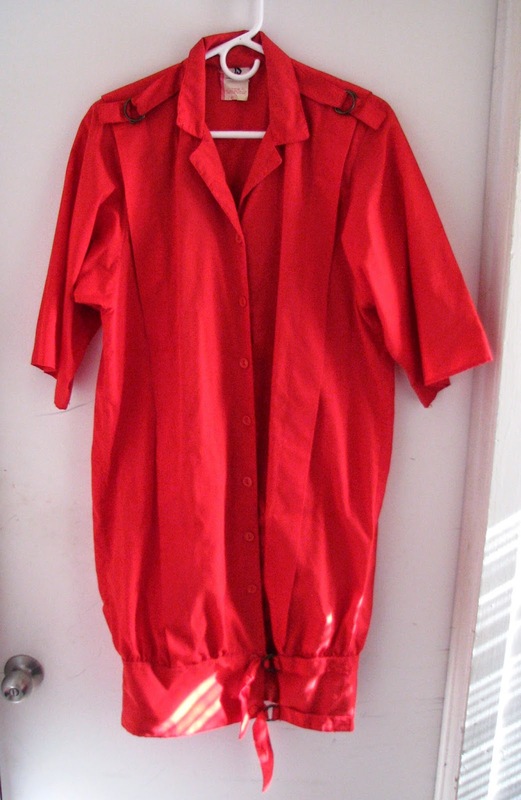 If the temperature ever gets higher than 15 degrees, it's going to be a good summer work dress; even though it's polyester, it's a polyester that feels more like cotton than plastic. 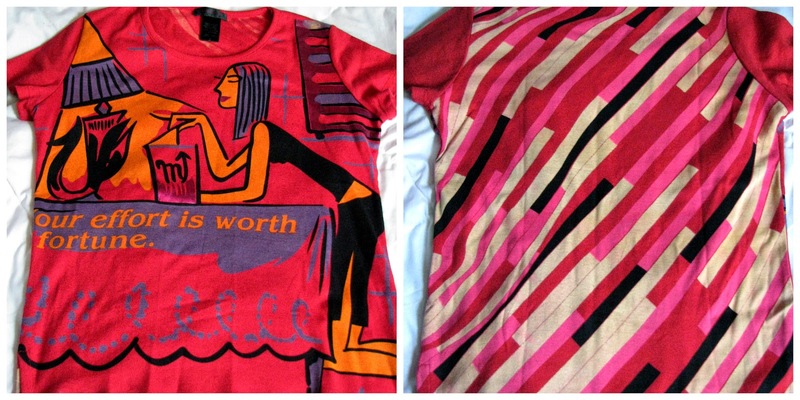 Another friend who is packing to move to New York for a new job found this Custo Barcelona t-shirt in her closet and passed it along to me. Do my friends know my colour preferences or what? A couple of weeks ago I arrived home to find a large package stuffed in my mailbox. To my surprise and delight, it was from Krista. Knowing what is happening in her life, I was even more touched that she took the time to send me a package of blogger love. I was sure the black dress with the folded-ribbon overlay would be too small, and truthfully, it is shorter than I usually wear, and kind of clingy, but I stuck a turtleneck and leggings under it and wore it to work anyway. The Betsey Johnson skull print shoulder bag was also in the package (skulls! bows! black and red!). 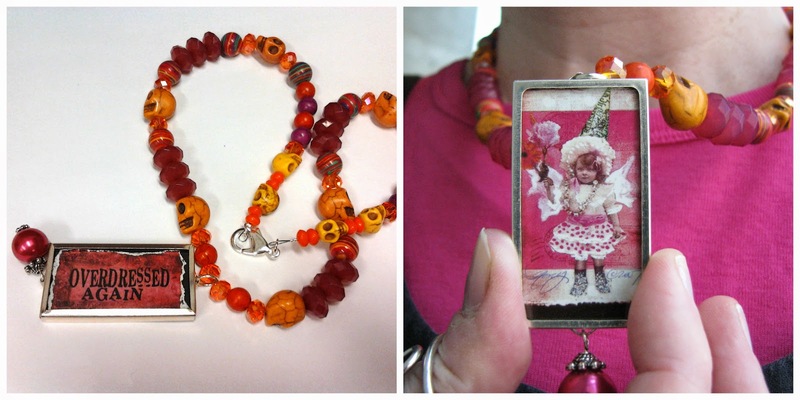 She also included a couple of necklaces, including the one above that she made for me. It was a big hit when I wore it to work, where apparently I am considered overdressed most of the time. I also received a parcel from Ariane, who has been recovering from a serious injury. The small blinged-out bag (for a cell phone maybe?) 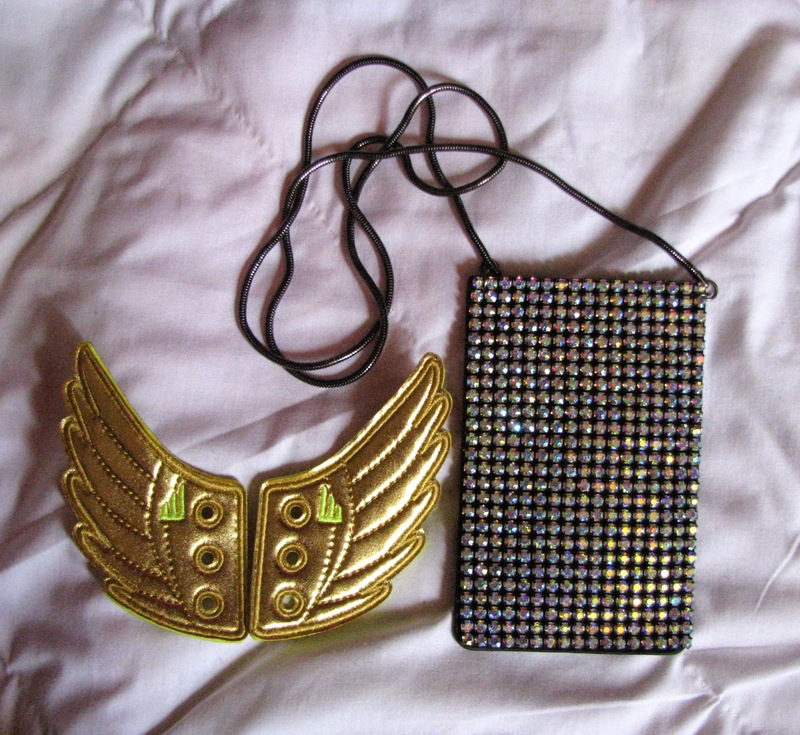 will make a cool necklace, and the gold wings will find their home on a pair of my shoes. Again, I am touched and amazed that people coping with serious emotional and physical upheavals make the time and effort to send me parcels of joy. Thank you both for your kindness, and for once again reminding me to be grateful for the wonderful people that my blog has brought into my life. I hope you all had a nice weekend. This week includes a quick trip to Toronto for the premiere of the Advanced Style documentary, which I'm excited to see. I'm sure there will be photos. I'm craving 80s lately - it must be coming on strong in the fashion world. 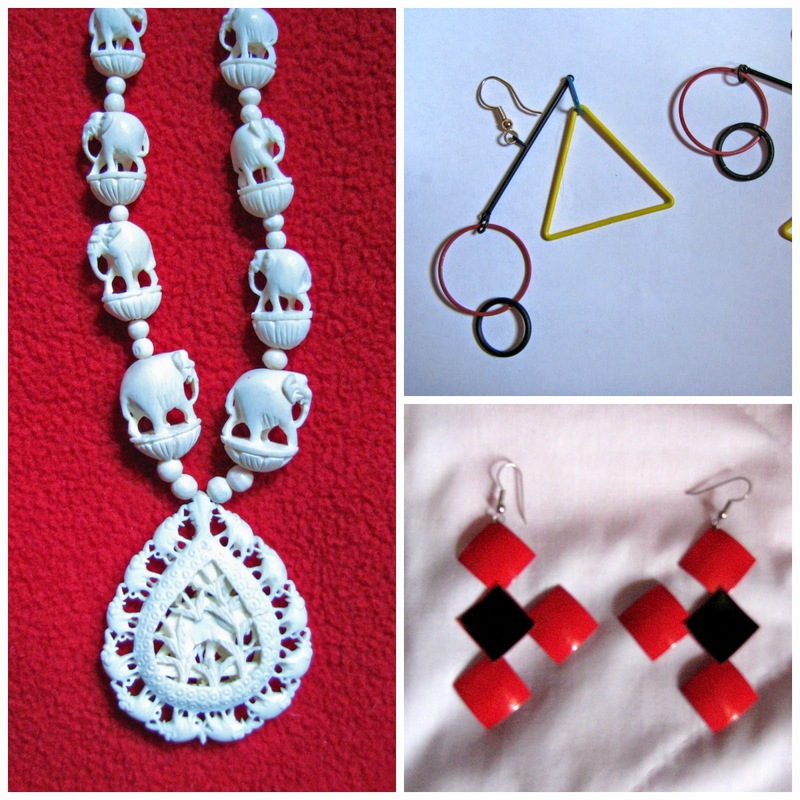 Love the red & black metal earrings. Have fun at the Advanced Style showing in Toronto! Oh what great joy to get such great gifts ! You look smashing in that black outfit . Well you deserve to be showered with gifts! 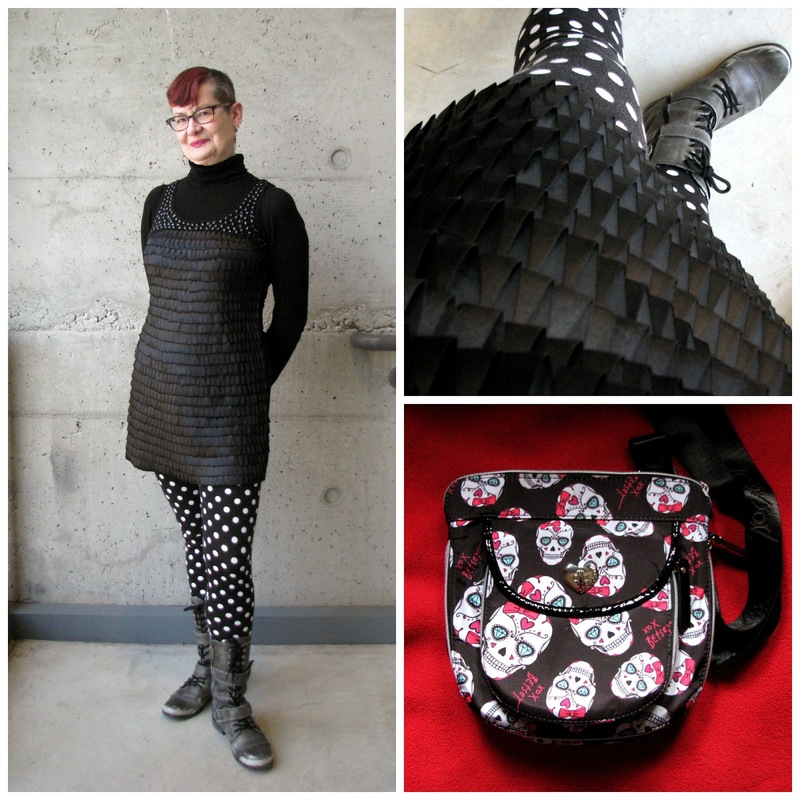 Krista's ruffled mini looks wonderful and shows off your killer legs a treat and the necklace is amazing. Ariane's blingy purse will look ace as a necklace, too. Parcels of joy from fabulous bloggers! !, you deserve lots of them!! What lovely gifts and buys ... all so perfect for you! Ahh, such lovely friends. Krista and Ariane are extra sweet to think of you in the midst of their own crises... What thoughtful women. 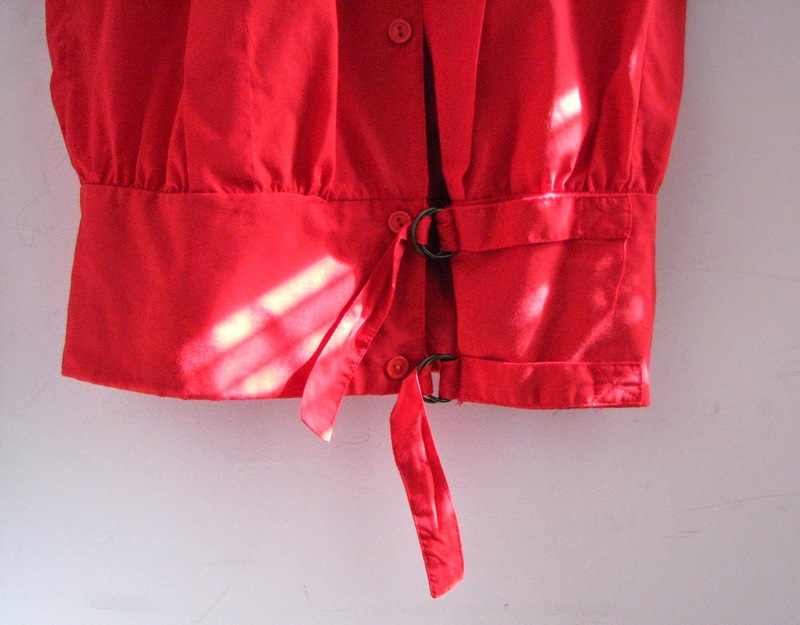 Yes, your pals certainly know all about your penchant for black and red! Great 80s frock and t-shirt, but I must say the black ruffled dress from Krista is my favourite. It's not too short at all, shows your great legs, and you have styled it perfectly. Overdressed again? There's a few of us to whom that applies! How wonderful to receive such thoughtful and perfect gifts. That black dress is really amazing, but the t-shirt is what I really love. Did you enjoy the documentary? I didn't realize it was in TO already. I haven't seen it yet - it has its premiere at the Hot Docs festival tomorrow night. It's not at the theatres yet. Awwwww such sweeties to send you all those goodies! I'm also touched by your amazing blogger buds. Lovely gifties and thrifty finds. Beautiful gifts from generous people who know you very well. You look very chic in the black dress from Krista, which you paired perfectly with the polka dot tights! So happy to see that you gifted yourself as well! Excited to hear about your Advanced Style documentary adventure! And see the fabulous photos that you are famous for. Oh my god, what a lot of fabulous finery! I love the mobile earrings. It seems I saw something similar not long ago, but I can't think where. You will wear all these things with your usual panache! that first dress has a crazy shape. We need a photo of you wearing it STAT! I love that black-polka-dot outfit. So sweet of all your friends to gift you such amazing things. love your finds too!! that plastic necklace is such a treasure! Love all the stuff you received! Isn't fun indeed! I have been looking at your recent posts- You lucky girl, you are out and about indeed, so many interesting things and events you went to! I'm doing much, much better, finally i seeing the light at the end of the tunnel as they say - I had a faboulous weekend, i felt great! Your health is the most important thing i kid you not, when you get it back, it's like being reborn! I will give myself another 2 weeks before returning to work, to make sure I'm 100%, but it's looks that way!